Reference number for this case: 9-Nov-54-Froberville. Thank you for including this reference number in any correspondence with me regarding this case. On June 9, 1984, local ufologists Christian Soudet and Luc Jean met Mr. Lucien Dufils, witness of a UFO sighting, and recorded his story on a cassette tape. It was published in the ufology magazine Lumières Dans La Nuit twice, in November 1985 and in January 1986, with sketches in the second publication. Lucien Dufils was 20-year-old in 1954, he is at the time of the investigation director of the municipal theater of Fécamp. During his observation, he was in the company of an unnamed female colleague, who was 34-year-old at the time of the observation. 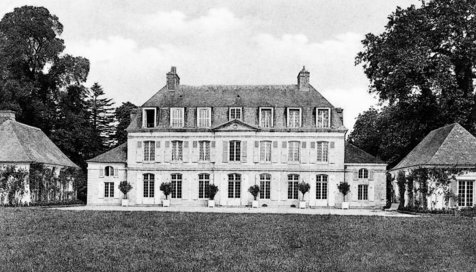 She was then the director of a health facility for sick children (probably the Château de Froberville, the place of the observation); she died in 1982 after a long illness. The sighting took place on November 9, 1954, between 06:45 p.m. and 07:00 p.m., in Froberville, near Fécamp in the Seine-Maritime department. Mr. Dufils reported that he remembers the date well because he had just won a grand prize for French song - he then left for a career of opera singer. He indicates that he and his colleague were returning from the farm where they had been getting dairies. The farm was in the Froberville castle's park. At this time of year, this castle was empty, there were no children inside. It was not raining, it was not cold, but there was a lot of wind, of a 70 to 80 km/h speed. When they arrived about 150 or 200 meters from the castle (location 1), he thought he was seeing behind the large groves of trees kinds of lights that sparkled; which were poorly defined. There was no artificial light outside, except that of the flashlight they used to light their way. They continued to move towards the castle, and at a certain point they found themselves in front of the phenomenon. At that moment, the thing was clearly seen: "It was an orange-colored circle a little green above and blue. My colleague said to me smiling 'it looks like a flying saucer.'" He replied: "one talks about them so much that we will end up seeing them everywhere." The thing was hanging about 30 meters above the ground, maybe 10 or 15 meters above the castle. and they were still moving towards the castle. They did not hear any noise coming from the phenomenon, but heard the wind blowing, quite loud: he indicated that one could think that the noise did not reach them because of the wind noise that may have covered a noise from the object. He reported that he has an eyesight problem, seeing ten times better at night than during the day, thus wearing sunglasses all day. This allowed him to see that the object was not round but more in the shape of a rugby ball, grey, surrounded by an orange halo. Above these circles there were like "kind of windows or tiles, it was more like tiles, but horizontal, longer than high." 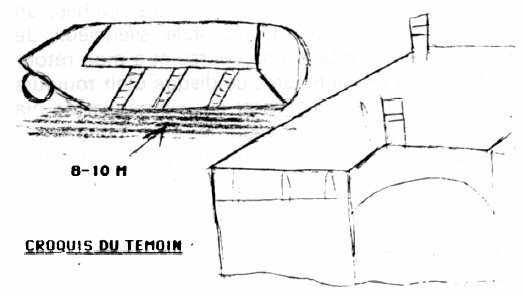 Sketch of the craft by Mr. Dufils. As they approached, the lights became dazzling and Mr. Dufils felt tingling in his eyes (place 2). Her colleague who "was a brave woman, she had her pilot's license, her husband was an officer on the Normandy Niemen", told him: "I want to be sure, I'm going there." He said "no, wait for me", but since she was a very determined woman, she had rushed 7 to 8 meters ahead of him, he had to run to catch up with her. They had arrived very close to the object, almost under the craft (place 3). And at that moment, the intensity of the light practically doubled or tripled and from there, the circles were much more apparent. He could not look at them anymore, and the craft - at that moment he became sure that it was a craft - rose at a disconcerting rapidity, still without noise, without hissing. It climbed upright for half a second, and it went away following a curved path to the sea, on the side of the cliffs. They lost sight of it in seconds. Time: around 6:45 p.m. - 7:00 p.m. Witnesses: Mr. Lucien DUFILS, 20-year-old in 1954, he was Director of a Health Establishment for sick children. He is currently Director of the Théâtre Municipal de Fécamp. During the observation, he was in the company of a female colleague who died 2 years ago (she was 35-year-old in 1954). "It was the evening of November 9, 1954, the trees were almost bare of leaves, it was not raining, it was not too cold, but a wind of 70/80 km/h was blowing. I was with a colleague, we were returning from the farm by foot when we arrived at 150/200 meters from the castle where she was working, It seemed to me that I saw behind the big trees, kind of lights that glittered, I immediately reported them to my colleague who told me "Yes, you're not dreaming." There was no artificial light outside except our electric battery to light our way. We found ourselves at a certain moment in front of this light, and there it was clear; it was an orange circle a little green above and blue. My colleague said to me laughing: "it looks like a flying saucer", I replied: "one talks about it so much that we will end up seeing them everywhere." But it is true that what we saw was suspended at about 50 meters (castle about 35 meters, so about 15 meters above)! We did not hear any noise at first, but since the wind was blowing quite enough, one might think that the noise did not reach us. I have a vision problem, I see ten times better at night than during the day, I thus wear dark glasses all day, it allowed me to see that the object was not round but more shaped like a rugby ball. Arrived very close to the object we noticed some kinds of tiles on the machine, it was gray surrounded by an orange halo, the lights were so intense that I had, too, a hard time to bear the light and my eyes tingled. Suddenly my companion said to me: "I want to be sure, I go there". I began to run to catch her up, she arrived before me, practically under the machine and there I saw the intensity of the light multiply by two or three, even I could not look at the machine. We could still hear no sound, no hissing noise when, suddenly, the craft rose with disconcerting rapidity, climbed vertically for half a second, then went in ascending curve towards the sea and in two or three seconds we could not see anything anymore." Witnesses: Mr. Dufils Lucien, 20-year-old in 1954, director of the municipal theater of Fécamp. During his observation, Mr. Dufils was accompanied by a colleague who died as a result of a long illness. Time: 6:45 p.m. - 1:00 p.m. Location: Froberville near Fécamp (76). Michelin #52, Fold #11 and 12. Observed phenomenon: object of oval shape (like a rugby ball). No sound, intense light below the object. So about the phenomenon, let's say celestial phenomenon, that I noticed on November 9, 1954, I remember the date well because I had just won a grand prize for French song, before leaving for a lyrical career. I was with a colleague who was the director of a health facility for sick children. It must have been around 6:45 p.m. - 7 p.m. It was not raining and it was not cold, but there was a lot of wind (70-80 km/h). We had just returned from fetching some dairy products on the farm in the castle park. At this time of the year, the castle was empty, there were no children inside. When we arrived about 200 meters from the castle (1), It seemed to me that I saw behind the large groves of trees kinds of lights that glittered, which were poorly defined. As we moved towards the castle, at a certain point, we found ourselves in front of the phenomenon. Then it was clear, it was an orange-colored circle a little green above and blue. My colleague said to me smiling "it looks like a flying saucer". The thing was hanging about 30 meters above the ground, maybe more, so at 10 or 15 meters above the castle. There was no noise except the wind blowing, we were still moving towards the castle. The phenomenon had the shape of a rugby ball, there were like above these circles kinds of windows, tiles, it was rather tiles but horizontal, longer than high. The closer we got the more the lights became dazzling and I had tingling eyes (2). My colleague was a brave woman, she had her pilot's license, her husband was an officer of Normandy Niemen. She says to me: I want to be sure, I go there. I told her: no, wait for me, but as she was a very decided woman, she had gone 7 to 8 meters ahead of me and I had to run to catch her up. circles were much more apparent. I could not look at them anymore, and the craft, because we can call it a craft, rose at a disconcerting rapidity, always without noise, without hissing. It climbed upright for half a second, and he went in an ascending curve on the sea, on the side of the cliffs. We lost sight of it in a few seconds. M. Dufils Lucien, aged 20 in 1954, director of the City Theater in Fécamp. During his observation M. Dufils was in company of a colleague who deceased after a long disease. 06h45 P.M. - 07:00 P.M.
Froberville near Fécamp (Department 76). Michelin map #52, folders N.12 and 12. Unknown object of oval shape like a football. No sound, intense light underneath the object. So as for the phenomenon, let's say celestial phenomenon, that I noticed on November 9, 1954, I remember the date well because I had just obtained a great prize in French popular singing, before setting out again into for a lyric singing career. I was in company of a colleague who was a director of a medical establishment for sick children. It was approximately 06:45 P.M. - 07:00 P.M., it did not rain and it was not cold, on the other hand there was much wind (70-80 km/h). We have been returning from getting some dairy products in the farm which is located in the park of the castle. At that time of the year, the castle was empty, there was no children inside. When we arrived at approximately 200 meters of the castle, it seemed to me to see behind the large thickets of trees, sort of lights which scintillated, which were not well defined. As we advanced towards the castle, at a certain moment, we happened to face the phenomenon. And there it was clear, it was an orange circle slightly green at the top and blue. My colleague told me jokingly "one would say it's a flying saucer." The thing was hovering at approximately 30 meters of the ground, perhaps thus at 10 or 15 meters above the castle. There was no noise except for the windblow, we were still advancing towards the castle. The phenomenon had the shape of a football, above these circles there was like some sort of windows, squares, they were rather square windows but horizontal, longer than high. The more we approached, the more the lights became dazzling and I had like ticking in the eyes. My colleague was a courageous woman, she had her pilot's license, her husband was an officer on the Normandie-Niémen. She told me: I want to check this out. I'm going. I told her: no, wait for me, but as she was a decided woman, she was 7 to 8 meters in advance on me and I had to run to catch up with her. We had practically arrived under the machine. At this time there, the intensity of the light practically doubled, tripled and from there, the circles were much apparent. I could not look at them anymore, and the machine, because you can say it was a machine, rose with a disconcerting speed, still without a noise, no whistle. It rose vertically during a half second, and it left in an ascending curve to the sea, on the side of the cliffs. We lost sight of it in a few seconds. Note: no source is given; the author suggests that helicopters are the explanation for this type of cases. 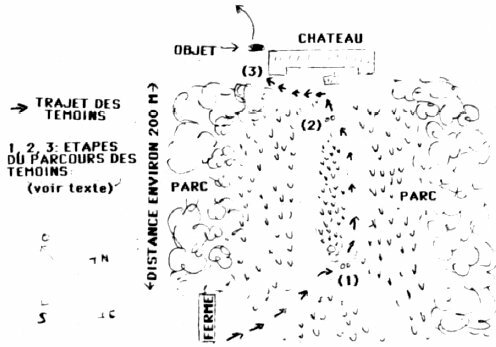 Luc Chastan indicates that in the Seine Maritime in Froberville on November 9, 1954 at 18:45 hours, "a man and a woman are in the park of a castle where the woman works coming back from a farm. At approximately 200 meters of the building the man observes lights behinds the thickets. Continuing their way, they then observe an object in the shape of a rugby ball of orange color a little green blue on the top. Structures were visible on the object like horizontal attic windows or squares. The object stood at about thirty meters above ground-level. It remained motionless whereas a strong wind blew. The two witnesses accelerate and come below the object. The already violent light and causing tingling with the eyes increased then in an intensity becoming dazzling. The object rose vertically during a half second, then left towards the sea in ascending curve. " "The Normandie-Niemen" was in fact a fighter planes squadron, formed with French pilots and engaged from March 1943, in the 1st Soviet Air Force. The observation took place in the night. From the farm to the corner of the castle, the witnesses moved about 170 meters. Above The facade of the castle, with its pavilions on the left and on the right. The object, according to the map in the report, was slightly to the left of the left pavilion. One may well like Renaud Leclet note similarities with helicopters; still it would be relevant to note dissimilarities also. Mr. Dufils was clearly attentive to the possible sounds, since he mentions the noise of the wind which might have covered sounds from the object. So he was not deaf. He does not say that it would have covered a sound as loud as an helicopter sound; he indicates in fact that a possible noise the object may have produced must have been, at the beginning of the observation, weak enough to be covered by a 70 to 80km/h wind noise. It must be noted that this wind noise must have been of a certain volume because of the many rather high trees in the castles' park. However, in all, the witnesses moved on 150 to 200 meters from the castle's farm: which takes a while, enough time to become aware of a helicopter noise, if one should have been heard. At spot 3 of the observation, the object would have been almost above them, we are told. It seems to me quite impossible that a helicopter hovering there in the air some 30 to 50 meters above the ground and at least almost above them is still not heard, wind or no wind. Its air displacement should even be felt. And Mr. Dufils specifies that they still heard nothing then: "still without noise, without hissing", the object rose and flew away. The colleague, who "had her pilot's license", thus no big eyesight issues, whose husband was a pilot in the Air Force, we are told, would probably have also been able to recognize a helicopter. 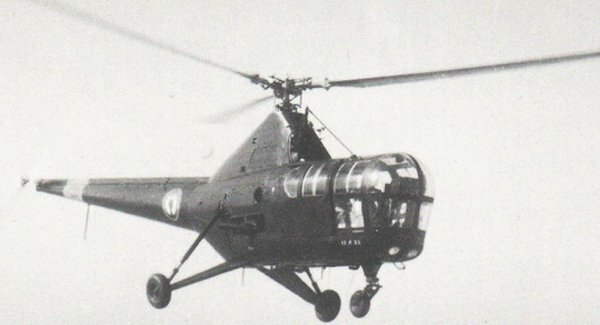 Many helicopter prototypes were developed in France in the early 1950s (Ariel I, Ariel II, Ariel III, SO 1310 Farfadet, Cantinieau MC101, SO 1220 Djinn). Foreign helicopters (NATO) also flew. 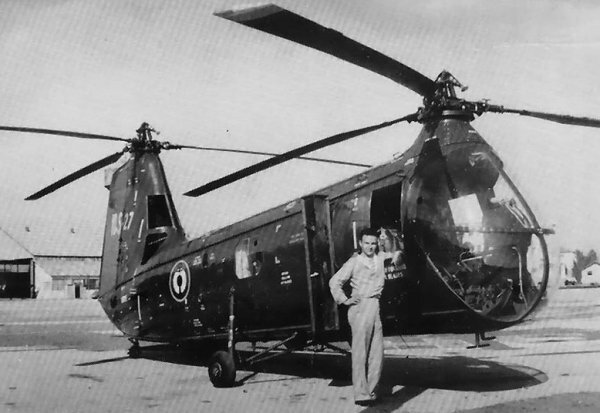 The French military had, in 1954, numerous helicopters of several types. However, the vast majority were engaged in Indochina and Algeria. It is difficult to describe in detail all the lights on all the helicopters that could have been there in 1954. The general principle is that there is one or more position lights (possible colors were red, green, white, blue); cabin lighting, possibly also specific dashboard lighting - both very dim - and one or more landing lights. 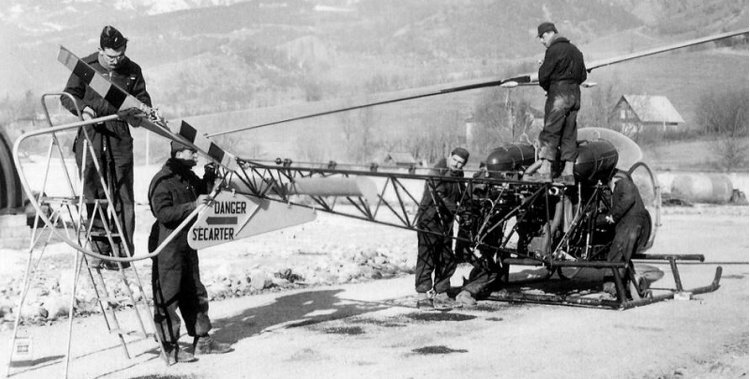 The Bell 47 had a headlight under the floor of the left seat at the front, facing forward (below). I do not think it has ever been of orange light color. The noise issue makes me skeptical about the object having been a helicopter. I would therefore note an unidentified, possible helicopter. [cs3] "Près de Fécamp (Seine-Maritime)", investigation report by Luc Jean et Christian Soudet, in the ufology magazine Lumières Dans La Nuit (LDLN) France, #257-258, page 38, November / December 1985. 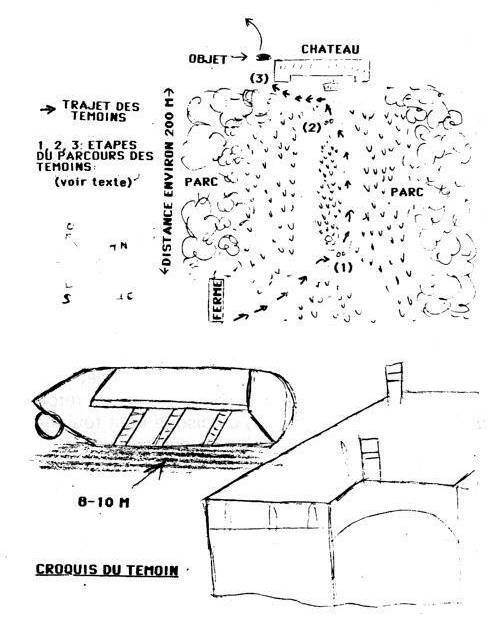 [cs2] "Près de Fécamp (Seine-Maritime)", investigation report by Christian Soudet, in the ufology magazine Lumières Dans La Nuit (LDLN) France, #259-260, pp 27-28, January / February 1986. [cs1] Personal file, investigator Christian Soudet, France, 1984. [rl1] Article by Renaud Leclet dated September 1998, in the ufology magazine Les Mystères de l'Est, France, #5, page 8, 1999. 1.0 Patrick Gross May 25, 2009 Conversion from HTML to XHTML Strict. First formal version. Addition [lc1]. 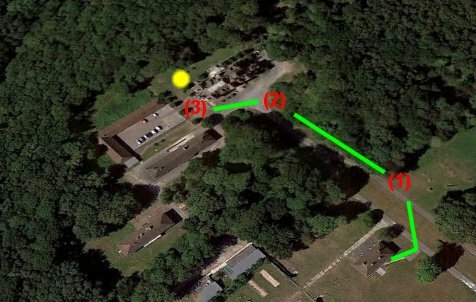 1.1 Patrick Gross December 2, 2018 Additions [cs3], [cs2], [lh1], [rl1], Summary. Explanation changed, was "Not looked for yet."